Henry has played football and wrestled since he was seven years old. He made both the varsity football and wrestling teams as a freshman in high school. 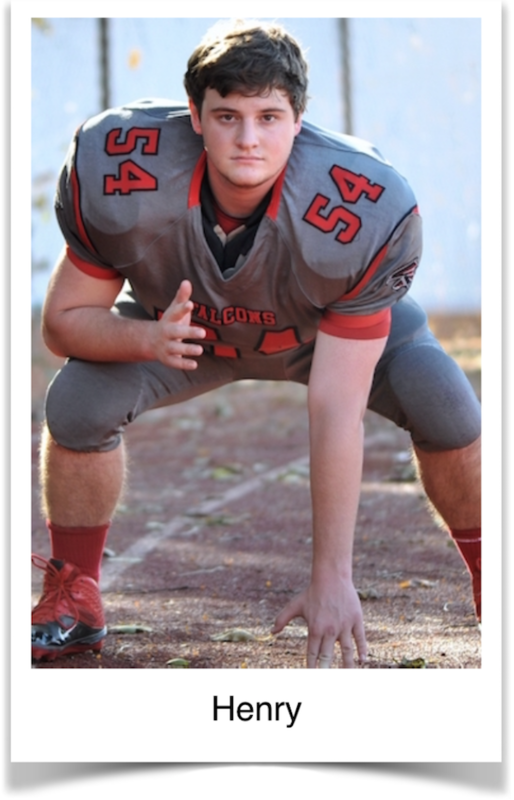 He was proud to start as a freshman on the wrestling team and as a sophomore for the football team. At the end of his football season Henry’s junior year in high school, he remembers he “punched out” against the opposing player as an Offensive Lineman and felt something pull in his shoulder. The football season ended and immediately wrestling season began. Henry didn’t take any time off and began practicing without any restriction of his activities. He was sparring and was thrown into an “all fours” position. As he landed on his outstretched arms, his left shoulder partially dislocated in an upwards and forward direction. He experienced severe pain and was unable to finish practice. In an attempt to recover quickly from his shoulder injury, Henry rested his shoulder for 10 days and used ice regularly. His pain had decreased and he decided to return to wrestling. However, he was quick to discover he was unable to perform at any level. Henry’s parents took him to his primary care physician who examined Henry and ordered an MRI to provide further diagnostic information. The MRI confirmed a SLAP (Superior Labrum Anterior/Posterior) tear. Henry’s tear was from the 10:00 to 11:00 position of the shoulder joint. A surgical repair was performed December 20th in an effort to move forward as soon as possible and maximize the possibility that Henry would be able to participate in both football and wrestling his senior year. Two weeks following surgery, Henry was referred to physical therapy by his physician. He chose Blaser Physical Therapy for their reputation of rehabilitating athletes to their optimal potential to return to their sport. He initiated his rehabilitation and began recovering his range of motion, strength, appropriate restriction of activities, and his confidence. Henry was uplifted by the gains he was making in all areas of his rehabilitation. He liked the flexibility of the physical therapists in their efforts to blend his physical therapy with his weight lifting routines at school. As Henry was progressing towards a discharge status yet still required adequate supervision, strength, and movement pattern advancement, his physical therapist recommended a training facility. His physical therapist worked closely with the facility and the trainer to provide guidelines to prevent any re-injury. As an extension of rehabilitation his training focused on strength building and conditioning. By late May, Henry had returned to full participation in sports activities and was able to participate in his summer football camps. He is hopeful to play football on the collegiate level and feels that his surgical repair and the excellent physical therapy he received at Blaser Physical Therapy has given him the opportunity to continue to pursue that goal.